Switzerland has named the date when terrestrial television will come to an end. From next month, digital terrestrial TV viewers in the country will see the label 'DVB-T' in the top right of the screen next to the station's logo, as well as occasional on-screen tickers warning of tbe impending change. Through the addition of 'DVB-T' on-screen, it will make it easy to identify terrestrial TV sources that need to be switched to other platforms and to reassure viewers who don't see 'DVB-T' on-screen that they don't need to take action. On 3rd June 2019, services will cease, temporarily replaced by an information slate before the transmitters are completely switched off. 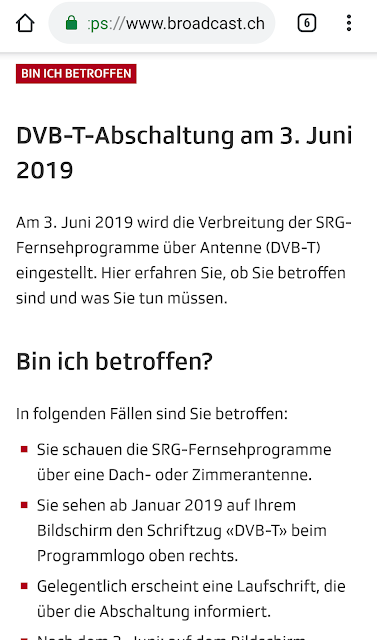 As reported by a516digital in September 2018, Switzerland's public service broadcaster SRG SSR was granted a consession allowing it to turn off digital terrestrial television signals. There are no commercial terrestrial TV broadcasts in the country. Each language area of Switzerland has its own multiplex of terrestrial TV channels from SRG SSR. The majority of Swiss TV viewing is done by cable, satellite and IPTV services. Satellite is thr default method in harder to reach mountain communities. Swiss television by satellite is offered to Swiss residents via a viewing card, as programmes are encrypted for rights reasons. Ahead of the closure of digital terrestrial television in Switzerland, SRG SSR has been reducing the power of its terrestrial television broadcasts - originally there was great potential to receive Swiss TV across parts of south-western Germany from transmitters on the edge of the Alps. Concerns from rights holders ensured that this overspill was cut. Information pages informing Swiss viewers of their options are now live, available in the local languages at www.broadcast.ch (screenshot of German information below). Further web support and a telephone hotline will be promoted in the new year. 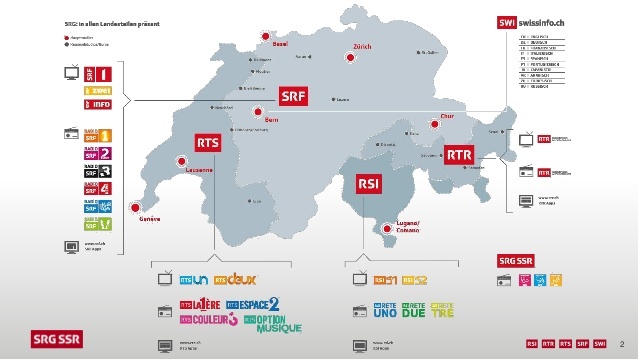 Image top: The structure of Swiss Public Broadcaster SRG SSR showing the services available in each part of Switzerland.